Talk to us about your debut series, historical occasion. The tour almost got cancelled. How did you feel your preparation was as a 19 year old given the circumstances that preceded that South African tour in 1998? I was really a blue eyed boy and raw in terms of my exposure to international cricket. I had recently captained a team to the United Kingdom and had done well with the bat, that propelled me straight into the Trinidad and Tobago (T&T) senior trials and I performed very well at the trials that led me to making my first class debut in 1997 for the Senior T&T team. Around the same time Brian Lara was at the top of his game as an international cricketer and was leading the West Indian team and was desperately looking for young talented cricketers to build a team and build the future for West Indian cricket. It so happened my timing fell in synch with his effort and what he saw in me sparked an interest. In 1998 I scored my maiden first class hundred in my 7th first class match against Barbados. In those days, anyone who scores runs against Barbados was given a little more attention. That performance selected me on that international squad to tour South Africa in 1998 without much first class experience. The whole premise of my selection was to blood a young player and provide him with opportunities and expose him to the international arena. I was overwhelmed, joyful and very elated with my selection. I knew that they were very much impressed with my organization and technique and felt they could really invest in me as a young player. It was the first West Indian tour post-apartheid to South Africa and at that time Nelson Mandela was the president of South Africa. With all this emotion, anticipation and knowing the historic nature of that tour I was pretty chuffed. We had some rumblings in the past between our player’s body and the board. But I never expected it to climax on the eve of our journey to South Africa. I recall clearly before I departed Trinidad, I was receiving phone calls from Lara, Courtney Walsh and some other guys who were in Dhaka, Bangladesh playing the ICC Champions Trophy Tournament. There was some hesitation about us boarding that flight and going to England enroute to South Africa. I did get on the flight along with about six or seven members of our team to tour South Africa because we were meeting the rest of the team in London who were coming from Dhaka. It was only when we got to London that things just went pear shaped. There was a lot of communication between the board and the players. Every morning when I woke up I saw a memo under my door saying I was fined 5%, then 10% and it kept going in sequence. So there was a lot of acrimony before going on that tour. Mentally as a young player, I was basically guided by the senior players. I really didn’t have a great deal of understanding with the issues they were fighting for. But 90% of my heart wanted to go to South Africa to get on with this tour and play some cricket. Having had a tough initiation in South Africa, you did not establish yourself as a Test player until after five years in 2003 when you scored those back to back hundreds in Bourda and Queens Park Oval, incidentally playing your first home series against the #1 ranked Australian side. Did you feel confident after those knocks that you had finally settled as a Test player in the WI side? I always had the confidence that I could dominate at the international level and really become a pillar of strength for the West Indian batting line up. A line up which really had little or no room for a young player in the middle order comprising Shiv Chaderpaul, Lara, Carl Hooper, Jimmy Adams and Ramnaresh Sarwan for most of the time I played. The only spot was at the top of the innings and I didn’t start my career as an opener in first class cricket, because that was the space that was available on the West Indian team, I had to groom myself and learn opening the batting at the highest level. The year 2003 was a benchmark for me as an international player. However I’ve had a start stop career since making my Test debut. If you look at my record I played 17 Test matches away before playing one at home. So after every away tour I was dropped for the home series which did not really help me. I played in Australia, NewZealand, South Africa, Sri Lanka, Zimbabwe, Bangladesh and UAE before getting my first Test at home. It was difficult for me because I was really and truly learning the game of cricket at the highest level in unfamiliar conditions. So the margin for error was very slim and hence I struggled at that level. Whereas the other countries invested in young players and ensured that they played a fair amount of time at the first class level in familiar conditions so that they can build a certain level of confidence before entering the Test arena. I’m not making excuses but I could never build a momentum during the early part of my career. I had it the other way around. I had to learn my cricket at the highest level and go through periods of failure before I could really come to a point in 2003 where I finally played in conditions I was very familiar with. If you look at my record as an international player, you will see a vast difference in terms of my home record as against my away record. You touched on the subject of providing opportunities and investing in a player. Do you think the WICB could have managed things better in your case? What do you think could have been handled better by the board? I would say that we have not made the right decisions for the improvement and development of our cricket. We don’t seem to understand what it takes to harness talent and that’s a fundamental problem in the Caribbean. We expect to see talent come on and contribute towards the improvement of West Indian Cricket. We don’t really have the infrastructure to take somebody that has the promise and ability to put them through a process which will bring them to a stage where they can consistently perform at the highest level. When I was selected, I was a young player. I begged for the opportunity to have cricket on a year round basis. I as a player was lacking in terms of contacts and networking and it was difficult for me to find an opportunity to play professional cricket abroad and I believe the WICB should have done more in helping their players in that regard. These are arrangements that the board should make available to young players. The board should be the facilitator in providing exposure and opportunities for young players in different parts of the world. You should provide opportunity for your young players in order to play in foreign conditions. I think this needs to be a year round process and this is the way you can develop talent. We hear so many stories about our great teams of the 1970’s and 80’s benefitting from county cricket. They benefited tremendously because they were professionals playing a sport day in day out fine tuning their skills playing in foreign conditions, playing against the best opposition and constantly improving their game. Today, in a 12 month period we play six first class matches, six fifty over matches and six T20 matches in the Caribbean during the domestic season. How could you expect to win a World Cup? How could you expect to develop players with only about 18 matches for the year in your home territory? That is just impossible. I was a victim of this approach and I represented this to the board and to my coach, Bennet King at that point of time. I told them I’ve only been selected for test matches for 30% or 40% of the year. After the series is finished in the Caribbean, I have no intense cricket to play and I find myself walking to overseas tours searching for practice and form, trying to find my feet having not played competitive cricket for two and half months and that to me doesn’t put me in a frame of mind to perform consistently at the highest level. But nothing happened. No amount of net sessions can put you in that state and that to me is a fundamental problem in the Caribbean. Fair enough! The board has done their fair share of mismanagement, but as a player and a stakeholder of WI cricket don’t you think senior players need to own some level of responsibility? Why is that ownership absent in WI cricket? Is that a cultural thing, since everyone comes from a different island? Not to forget the role of WIPA in all this bungling who always seem to be in the center of a conflict. I think you’re making a strong point. We have had players who have taken responsibilities and I am sure if you speak to all the players who were in that position to take responsibility, they would have told you that they wanted to take responsibility. The WICB had an approach of divide and rule towards the players. If you as a player came across as too powerful and influential, there was always an approach to cut you down and victimize you as a player In that way it places you in a precarious position. A position where you had to look after your own longevity and self interest against the interest and future of West Indian cricket. You’re really stuck between a rock and a hard place and that is what WIPA fought for. WIPA fought for developing an organization that will represent the views of the players to mitigate this divide and rule approach of the administration. For instance, if there’s an opportunity for en endorsement contract for a certain player, maybe the most marketable player, and if he were to be approached and if that player did not agree to the terms and conditions of that particular contract, all they will do is just put another player of lesser repute. It was in essence very unfair for that player who was really doing well and should have deserved the opportunity to earn more. But that is how it was operated even from a selection point of view, if a certain player was coming across as very influential and probably anti-WICB in terms of its policies and approaches, that player was side lined. So that leaves no choice for the player but to start thinking about himself rather than the overall interest of West Indian cricket. If you had to go back in time and change a couple of things what would you have changed that would have benefited you and WI cricket? I would have wanted to change the amount of cricket I played before making my Test debut. I was virtually out of school cricket. My experiences were limited to playing at zonal level, under 19 levels, under 16 levels and vast majority of my cricket at that point was playing against other secondary schools in T&T. I did have the opportunity to tour England before the South Africa tour with the West Indies under-19 team in the youth World Cup. Both myself and Chris Gayle were the openers at the top of the innings and we had a great partnership and a great result in that youth World Cup but I was really inexperienced and not well prepared when I made my Test debut. So that is one thing that would change. The other thing that I would change is the infrastructure that we had in my days. I really never had the opportunity to use a bowling machine during my formative years. I never had quality nets. I never had quality bowlers. I had limited interactions with former West Indian players who would have shared experiences which would have reduced my time that I would have spent in trial and error. These are things that would have accelerated my learning and those are fundamental things that I would have changed. Also more exposure to playing in foreign conditions before playing at the international level if I had the chance of being part of the West Indian A team. That would have surely developed me as a better young player and would have served WI cricket well in the long run. Talk to us about your captaincy experiences having lead T&T for a long time. If it’s one thing that I have done throughout my career as a cricketer, I’ve always been very observant; I’ve always paid a lot of attention to detail. My First Captain in the first class and Test level was Brian Lara. I’ve had the opportunity to play a lot of cricket under him and a lot of cricket around the West Indian greats and I’ve been able to pick up on a lot of different things in terms of man management skills, in terms of some of the things that captains were not doing right, some of things that they were doing right, I saw a very one dimensional approach to leadership. Some captains were very dictatorial, some captains were laissez-faire in their leadership approach, some captains lead from within and all these opportunities and experiences allowed me to shape my approach to leadership which is really not a one sort of approach. I was able to understand my players better and to know that my approach to a particular player was tailored towards him as a person and what made him tick and what made him inspired. These are the sort of approaches that allowed me to stay one step ahead of the game in terms of understanding my players, motivating my players and getting all my players to work in one direction and taking ownership to do what we did and achieved as a team. Being a very successful captain for Trinidad & Tobago and having heard from various corners the talk of “going it alone”. Do you think it’s a feasible solution given all the drama and controversy that surrounds West Indian cricket? What I can say is I had a situation in 2011 when we were participating in the Champions League in India. Because of the amount of success that we achieved as a national team in an international arena, as leader of that particular team and being at the helm of a very successful unit, I was constantly bombarded with arguments and thoughts and all the more reason why as a T&T senior team, we should go on our own. Now personally that was never a thought that I harbored but again I have been someone that has always appreciated and taken notes of the evolution of the game of cricket and some of the things that are required for you to stay relevant in international sports. It’s an argument which I think is healthy. I know that there was a report from an ICC appointed person to do some sort of analysis in terms of the well being and development of associate nations in the game of cricket. Some of the findings coming out of it were for associate nations and independent countries to play on their own in order to promote the sport and to create more competition amongst themselves, in order to make sure that the funding is shared more equitably than what it is now. That argument led me to having conversations with a couple of persons who were very close to that particular report and research. They were very adamant that T&T should explore that option. Now whether that was a feasible position I can’t say because at that point in time I was not in a position to actively proceed with that because I was still very much a full on player. But I think that there is a lot of merit to what is being said, again that will have to be done against West Indies cricket, what we’ve accomplished and the legacy we built over the years. Personally I would love to see the tradition of West Indian cricket move forward. I don’t think it’s beyond us to build a successful West Indian cricket board and cricket team across the spectrum. I just think the focus needs to be in the right areas and we could find ourselves back at the top in terms of world cricket. Your take on CPL and do you think that will be able to revive the interest in the region given the fact that Tests are almost dead around the Caribbean? I think the Caribbean Premier League is really something that has sparked a revival in terms of West Indian cricket and I can go way back to the Stanford tournament which to me provided the impetus for us to go on to win that ICC t20 World Cup. I think the exposure for young players, the exposure for new talent, the attractiveness of that version of the game for persons who may not have followed the game in the past are very critical towards building a successful West Indian team. The attraction for corporate sponsors for the spectatorship which has been dying in the longer version of the game we’re all seeing that coming for this short version of the game. I just feel it’s a matter of creativity and an administrative savvy that is required to regulate and manage the sport. They both need each other to move forward and to develop West Indian cricket. We’ve not been able to manage it properly. I think we need to have a more hands on approach towards all versions of the game in the Caribbean and the West Indian cricket board need to get active in terms of how they regulate the game, how they manage young talent because you can easily find all our talented players lured in to T20 cricket and no one wants to play the longer version of the game. So there needs to be some sort of policy, some sort of guidelines, framework that will regulate this which will create incentives on both sides of the coin. So to answer the question yes I think t20 cricket and CPL has got a lot more positives than negatives for West Indian cricket but I also think there must be some sort of regulation going forward in terms of all the versions of the game. You launched a DVD series for coaching. You are a pretty articulate person. You have been reasonably successful as an international cricketer and a legend for Trinidad and Tobago. Do you have any plans to get involved with West Indian cricket? Of course. I always will remain a servant of West Indian cricket. I’ve always been very proud to represent the maroon, the red, white and black and to represent the federation which is greater than my own country Trinidad and Tobago. I will always make myself available for WI cricket. I am actively involved in cricket here in Trinidad through my foundation, Daren Ganga Foundation. I’ve gone ahead because of my experiences as a player to develop this useful platform for young players and for their own development. I don’t think we have any product in the Caribbean and globally that allows young players to interact with the West Indian greats and to see their basic techniques of cricket and lure young persons to the game of cricket itself. So all these are things that I lacked and did not have at the start during my formative years of my career and I am trying to make it a lot easier for our next generation of West Indian cricketers. Obviously it is to ensure that they have the basic techniques and tools to be better at what they are until they reach a certain level. I am involved in the administration of the game here. I am a member of the Trinidad and Tobago cricket board, albeit a minority member but you know the intention is to take leadership and really start making decisions and doing things that will impact directly on the quality of players here in Trinidad and indirectly in the West Indies. We need to effect a culture change. I think we need to have more of our young and recently retired players involved in the development of the game. Sometimes you tend to find some of our former players very remote from the game and I want that to change. I have spoken to guys from New Zealand, Australia and they are having the same challenges with players not understanding how the game has evolved and that’s a gap that needs to be addressed here in West Indies as well. Two Tests in your career that I want you talk about 1. WI vs NZL in 2006 and 2. WI vs SA in 2007. You played a major part in both the games. One was lost, which you should have won and the other you won and I recall you taking a great catch. Talk to us about those games. I vividly recall that 2006 Test against New Zealand at Eden Park, Auckland. It was my first series following a bumper of a first class season in the Caribbean where I scored the most runs in the domestic competition and won the Viv Richards award for batting and also led T&T to the regional title. That gave me immense confidence going into that series since I was on top of my game. It was difficult in terms of the conditions in New Zealand where it is always cold, windy and seaming. Shane Bond was at his very best. It was a seasoned New Zealand team lead by Stephen Fleming and we had a wonderful opportunity to go one up in this particular Test series. We were chasing about 290 odd [291 runs] to win that Test. Both myself and Chris Gayle had just put on about 140 odd runs for the opening stand and that’s when Chris struck a six up into the stands and it hit the roof of Eden Park and the ball could not be retrieved. In effect that changed the momentum we had. When the ball was lost, there was no used ball that the umpires could provide to continue the match and what they did was they took a brand new ball scratched, scraped it on the concrete surface and knocked it off a couple of times and it was virtually a new ball that led to a flurry of wickets, since the ball started reversing considerably. I could not just hold on but the most critical thing was the changing of the ball and the fact that New Zealand had the opportunity to use a brand new ball which was roughed on one side. So they basically took advantage of that situation and Shane Bond went straight through the middle order and we found ourselves on the short end of that particular game and ended up losing by 25 odd runs. The South Africa Test was one of the biggest highlights of my career, beating South Africa in Port Elizabeth in 2007 in the first Test of the series. We started well and found ourselves on the last day leading South Africa by a significant margin. Again, both myself and Chris Gayle put on I think a 100 run partnership in the first innings in that particular Test match having been inserted by Graeme Smith. We stayed in front all the way through. In the second innings it was really do or die since wickets were falling all around me. I remember getting run out, a rather sad way to go. Herschelle Gibbs at backward point with his left hand picked up and ran me out at the non striker’s end with a direct hit. However I felt we definitely had enough on the board to win the game. I caught Graeme Smith at short leg from a short ball from Fidel Edwards, I had to dive all along the turf to complete that catch. So that was a remarkable victory. Unfortunately we weren’t able to hold on to that lead. Chris Gayle got injured and we had a lot of changes that occurred after that Test and we could not win the series, but nevertheless two very good highlights in terms of my Test career. Your memories of playing with Brian Lara for the West Indies and T&T. To put it simply, Brian Lara was a cricketing genius. Just the way he analyzed the game of cricket. I was very privileged to make my first class debut and my Test debut under his leadership. He mentored me as a young player all the way through. A lot of my leadership skills about the game in terms of the strategy were because of my association with Brian. The sort of lessons he taught me where phenomenal. He had a great eye for detail and was very analytical in his thoughts. His ability to analyze the ebbs and flows of the game, his ability to analyze his own game and because of him knowing himself and his limitations he would develop strategies to counter the opposition. Brian would use members of his own team to strategize against the opposition. If I was batting in a Test match with him and I have been there for a while he would ask me to face Shane Bond or Steve Harmison for the majority of the time till he settles in. He would ask me because of the solidness of my technique to take more off that bowler to give himself a chance to get in and then for him to obviously be able to play his game and counter attack certain bowlers. He was very detailed and meticulous in terms of whom he should go after, who he should attack and who he should defend. At some point of time he will be controlling the innings from both the ends. So if you look at his performances, you will see a Daren Ganga, a Jimmy Adams, a Shiv Chanderpaul were always very critical in terms of his success because he will use these players, not in a bad way but as the ideal foil to counter the opposition. To me that was a different level of play, was a different level of analysis. He is a genius so to speak and that to me is his greatness. I would have loved to have had a better test average. Although if you take my career for the last five years of playing international cricket, I would have averaged in the early 30s, because I had all this extended time playing away from home before I really started to come in to my own as an international player, it impacted my overall average. That is one regret that I have as an international player. I cannot say that I had any regrets playing for Trinidad and Tobago. 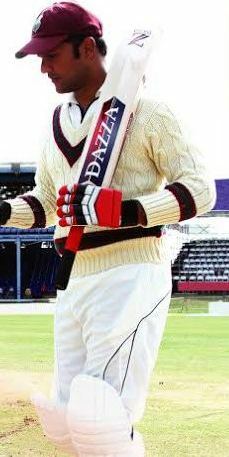 I have been able to achieve very good things and have been the most successful Trinidad and Tobago captain. I scored the most centuries, most runs and hold the highest individual score. But I really wanted to contribute more to West Indian cricket with the bat and probably an opportunity to lead the West Indian team for an extended period of time where I would have had the chance to infuse my philosophy about the game, influence selections, have input in terms of developments of the game and the process of harnessing young players because I think that is absolutely critical. if you were in the position of a leadership you must also focus on the backward linkage and that is our first class cricket, our U-19 cricket, our infrastructure and the way we do things must be essential part of the administration of the game if you want to really be successful as a West Indian Captain and maybe the opportunity to do that for an extended period of time is one of the regrets I may have had.